screen at St. Symphorosa Church, 62nd and Mason. The award-winning thriller "Jurassic Park" will run at 7:30 p.m. Saturday, September 24. Pet-friendly event, assuming your pet is friendly. Bring the family dog, if you want. Bring a picnic basket if you'd like. There also will be a concession stand with hot dogs, nachos, cotton candy, etc. 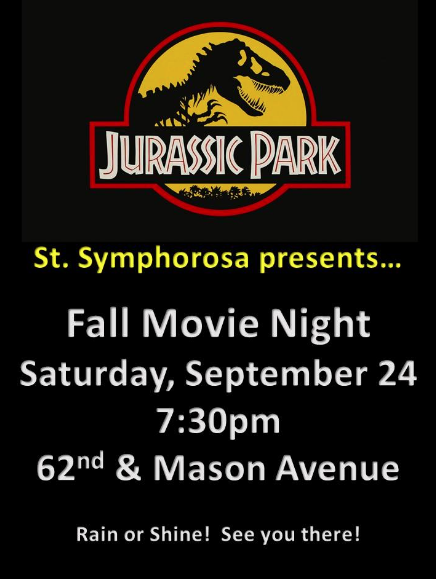 This family-fun event is sponsored by the St. Symphorosa Parish Transformation Team.